Popular Holiday Calendar Cards are one-of-a-kind in the industry. They use a unique C-fold design which features a full-color outside holiday design, with a 12 month calendar on the inside. And that keeps your brand in front of your customers all year long! Designs are perfect greetings for Christmas and Thanksgiving. 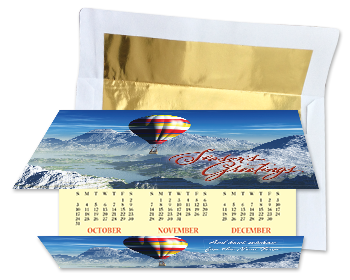 Our calendar cards also represent a great value.